Sometimes Pictures could bring a lot of organic traffic to a website. Getting traffic From Google Images is neither difficult nor stress-free because the entire thing depends upon the way a person optimizes his images for SEO (Search engine optimization). Since, Blogger is not renowned for its SEO Friendly experience. Therefore, a person has to optimize each and every element of his site on his own and that also includes Images. If an image is optimized with proper techniques then, it could bring plenty of traffic without any hassle or breakage. Those who think Blogger Platform is not ideal for Image SEO then today in this article, we will learn How to Optimize Images for SEO in Blogger. 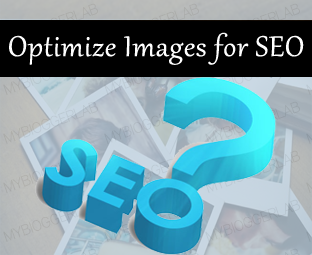 How To Optimize Images For Better Search Engine Ranking? The techniques which allow pictures to rank well in search engine are not challenging because a tiny modification could result in high ranking. Therefore, if anyone wishes for more traffic then, he must learn how to optimize pictures to get most out of Google image search. When a person see’s a picture of a man laughing with a great pleasure, he can easily recognize that what is going on in the picture. The foremost problem is that the search engines cannot recognize what going on in the picture. Instead of leaving everything for search Spiders, a person should add Image ALT and Title tags to help spiders. What is Alt Tags? In short, it is a bunch of text which allows Search engine bots to understand the reality of an image. The procedure of adding ALT Tags is extremely straightforward. Adding alt=”Your Image Alt Here” in the HTML coding of the images is the solution. Consider the Following example. 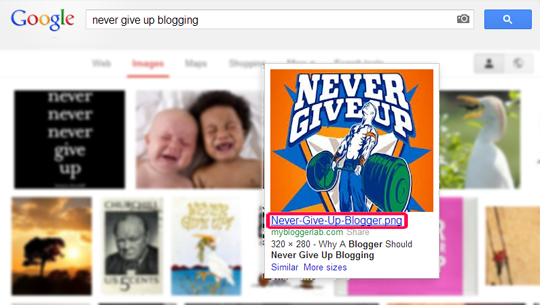 Go To Blogger.com >> Add new Post >> Upload a picture. Now select the picture and a small Toolbox would appear. Select Properties and insert ALT Tag and Title and Press OK to conclude. Before uploading a picture to your site, try to give it a proper name. Select a descriptive file name. Rename a file name with the keywords that you want that picture to rank for. For example, if anyone wants to test the reality then he can easily search for images in any search engine. They always have the keyword that a person has searched. To learn more consider the following screenshot. High speed websites always rank well in the search results, right? 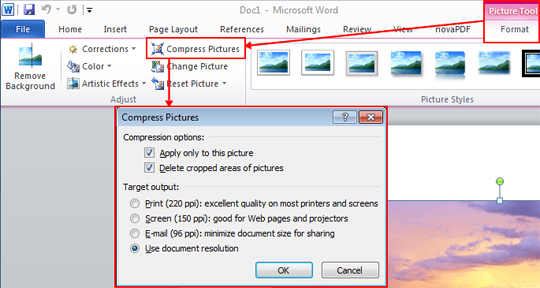 Therefore, it’s essential to reduce or compress the size of a picture. Furthermore, DO NOT resizes your large pictures into smaller sizes through CSS. Resizing through CSS Doesn’t helps because browsers first load the large images and then convert them into smaller size. Try to resize all the pictures through editing software, it soaks extra time but could increase your load time. 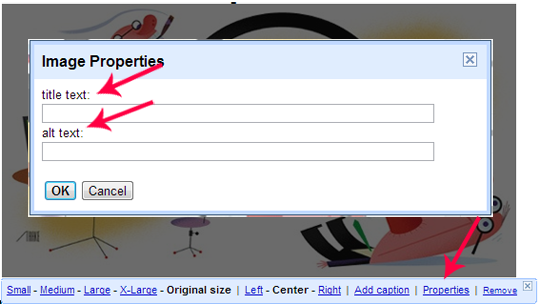 Everyone prefers to use the JPG Extension because it allows search spiders to crawl and index the file correctly. However, if a JPG Format possible then, a person should stick with something common like GIF and PNG. Don’t neglect it because a small tweak could help a site to rank well in the SERPs. 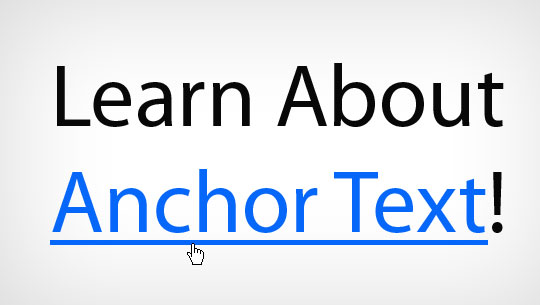 To rank a content high in SERP Ranking we always prefer Anchor text linking. We always select the most appropriate keywords and then utilize it in text linking. Similarly, we can use the same technique in images too. Just utilize delightful keywords while linking in an article. Furthermore, don’t use common keywords likes Pic and etc. Hope that techniques would help everyone in getting more traffic from search engine. Finally, it’s worth nothing if a person is copying photos from other sites. Editing someone else photo is just as if a person has optimized a copied content with different synonyms. This would not look decent in the eyes of search engine. Furthermore, if anyone has spent hours in formulating a perfect article then, do not forget to optimize its photos because it would bring extra traffic to your site. This would not take a lot of time but would provide quality based results. It would just act like “Icing on the cake”. Take care till then, Peace, Blessings and happy optimizing. Great tips. Some bloggers tend to forgot about image optimization. This article will surely help them out to start optimizing their images. Nice information. But it could be nightmare for someone to add Alt tag to each and every image. I would recommend users who have more than 100 posts use this script This script would automatically add "alt" tag to images. Thanks My friend,..Nice Tips, Keep it up.